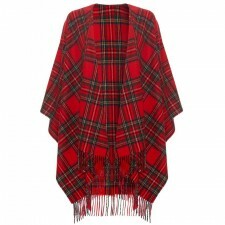 So soft, a real delight to wear, this cashmere ruana wrap (also known as a serape) is shown here in the Royal Stewart tartan. It is part of our exclusive Gretna Green Cashmere Collection, you can be assured of the quality of this product. It is shaped around the neck so that it sits comfortably on you. This would make a lovely gift or a treat for yourself.